In a recent Times Op -Ed piece (“Is the Universe a Simulation?” NYT 2/15/14) the mathematician Edward Frenkel cites a paper written by the physicists Silas R. Beane, Zohreh Davoudi and Martin J Savage,” entitled “Constraints on the Universe as a Numerical Simulation.” According to Frenkel, the writers of the paper “outline a possible method for detecting that our world is actually a computer simulation.” It’s something that would account for how we are able to discover mathematical theorems from Euclid to Poincare. It’s also something which answers another question which Frenkel poses, “if math is only a product of the human imagination, how do we all end up agreeing on exactly the same math?” The answer, according to Frenkel, is that humans are merely “discovering aspects of the code that the programmer used.” Of course, taking this idea one step further, can we all agree that if the universe as we know it is not now a computer program, than it will one day be, not one, but many. Forget about programmers. Computers will program their own realities which will be more naturally selective than so called reality. Man as a biological organism is rather frail, but cybernetic images are eternal and capable of producing all the elements of human life, including taste, touch and consciousness that we find within the rather anachronistic invention known as Homo sapiens. Indeed nature itself can be looked at as an anachronism together with the vessel in which it’s contained, so-called spaceship earth. There are those who toss and turn anxiously about the environment and the fate of our progeny. Some philosophers like Samuel Scheffler of NYU, author of Death and the Afterlife, even worry about the fate of human endeavor in a world with no future. 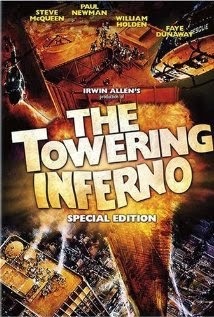 The Towering Inferno was a famous thriller of the 70’s which prefigured the fall of the Twin Towers. But the earth will be obsolete long before it becomes a spherical inferno hurtling toward a dying star. Mankind will have abandoned it eons before for the pleasures and possibilities of cyberspace. There is something creepy about all this. It reminds me of the cautionary biblical fable about hubris, the Tower of Babel. It's as though technology is driving the train and has disabled the brakes. More and more often I feel as though we humans are just along for the ride. Hmmm...or perhaps we really are at the mercy of the Tralfamadorians as the great prophet Kurt Vonnegut, Jr. described. It’s something like the objects of man’s creation take on a life of their own. They talk back, then they rise up and get rid of their maker.